This Supreme Turnout Blanket by North Wind is made from the finest materials available. 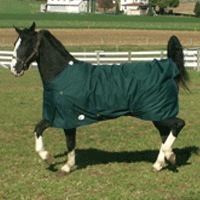 The quality horse blanket is waterproof and comes with a 1200 denier outershell with a 300 microgram fill. This beautiful piece of horse clothing features a double buckle closure at chest with crossed surcingles and removable hind leg straps. Too assure mobility and comfort the turnout blanket comes with a satin nylon liner and shoulder gussets. The blanket offers an extraordinary feel, yet are easy to work with and provide maximum comfort for your horse, it features satin nylon lining, an open front with closure, and shoulder gussets to create comfort within the horse blanket.